Zest Communities: Thanet, run by brightshadow, is a 6 month programme of arts workshops and cultural experiences for people living with dementia and their carers. Participants were invited to bring one or two memory items of their choice, in order to facilitate the making and sharing. They could think about a piece of fabric – clothing, bed or table linen, a book, a piece of writing or music, a photo, anything with a special story for them. A pre-cut acetate ‘memory mat’ was given to each participant. A range of memory materials were provided – fabrics, paper, books, music scores and maps, from which strips were taken for weaving into the mat. 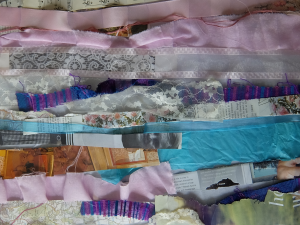 The variety of fabrics – silk, wool, lace as well as embroidery threads and ribbons, plus the range of books – Shakespeare, poetry, cookery, sewing and dressmaking, home furnishings, cookery, gardens and birds, plus music – Beethoven, Gilbert and Sullivan, newspapers, magazines and maps… stimulated sharing of stories and generated lots of fun in the making. It was in the making that a lot of the sharing took place. Despite a random selection on my part of the choice of materials,participants of the workshop managed to find their own stories amongst the large pile of old and used ‘things’. The person’s favourite play, violin music, her nursing past, his travels – perhaps not whole stories, but important fragments were pieced together. 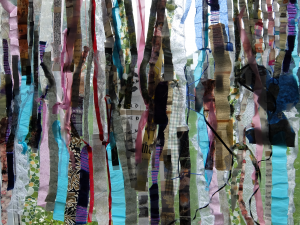 In weaving the individual mats into one large piece, I was able to see so clearly the connections between the mother and her daughter, between another person and his carer friend. The weaving also draws together the memories of the whole group, some seemingly not connected to each other. The individual stories become one bigger story.